Abbey Lodge01274 583854work01274 592416fax HotelA boutique style hotel located in the market town of Shipley, less than one mile from Saltaire, World Heritage Site and three miles from central Bradford. 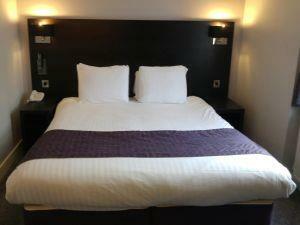 Our rooms feature comfortable beds with Egyptian cotton sheets. Each room also has a spacious work area, free WiFi, flat screen HDTV with Sky TV channels and a DVD/CD player. All bathrooms have power showers, hairdryers and complimentary toiletries. Every morning we serve a full breakfast menu including full English, Continental or Vegetarian options. We are situated 500 yards from the centre of Shipley, directly opposite St Paul's Church.